Building trust is of absolutely central importance to an organization. It is also a pillar of a person's success at work, regardless of your level, sector or company. I have learned that companies should forgive a lack of results, if only for a certain period of time, but be merciless if someone or something breaks a relationship of trust. Take no prisoners if trust is broken or damaged. Trust and confidence are not traits that you have, but traits that are built, maintained, learned, nurtured and protected. This is something that the most inspiring political leaders of recent times have recognised. 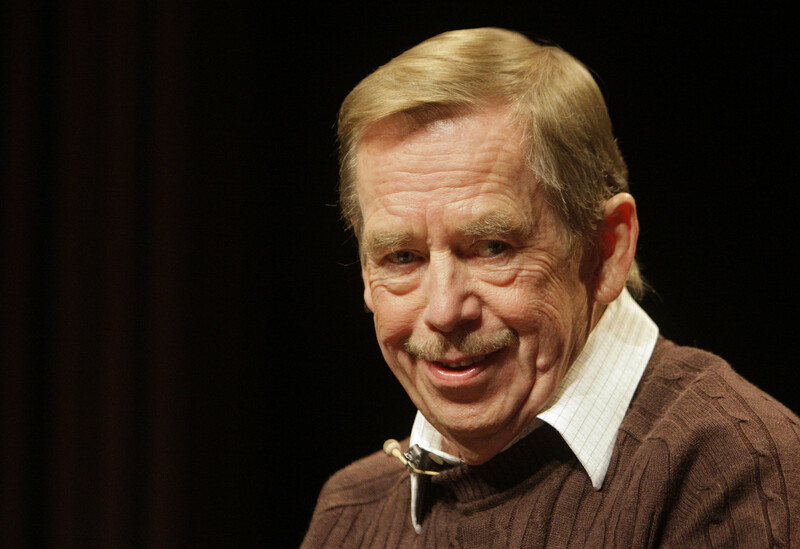 Vaclav Havel, a poet, philosopher and dissident, spent four years in prison for his beliefs. After his Civic Forum party played a major role in toppling communism in the Velvet Revolution of 1989, he became President of the Czech Republic and told a fractured country that "We must learn to trust each other." Nelson Mandela spent 26 years of his life in prison in apartheid-era South Africa. When he was inaugurated as President, he invited the same prison guards who had harassed and humiliated him for years as guests of honour. The message was clear: if he could trust them, then everyone could make a similar leap, launching a whole process of reconciliation to rebuild the country. 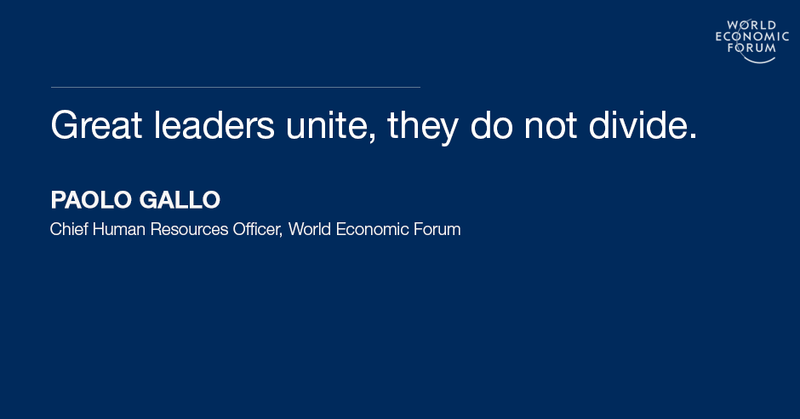 Great leaders unite, they do not divide, and they always start by building trust, not walls. Before you think of strategy or budgets or policies, you need to think of trust. 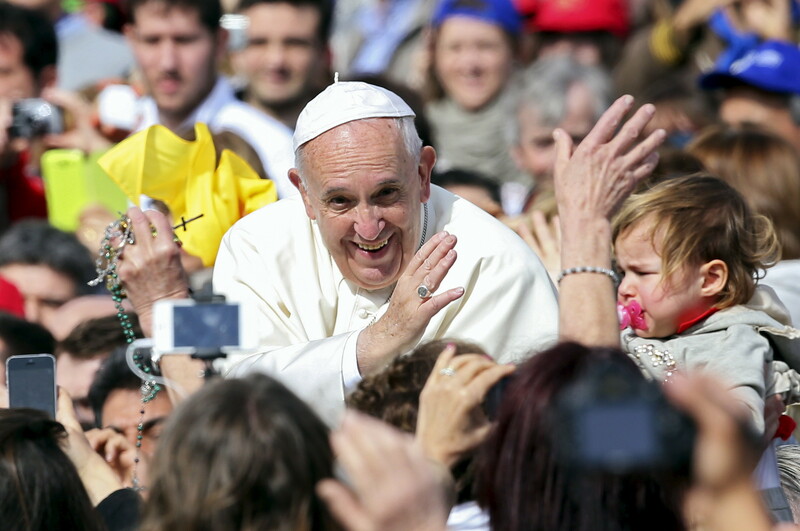 "Build bridges, and tear down walls": this is how Pope Francis expressed the same idea, in a religious context. How to put it into practice? Take a pencil and paper, and write the names of 20 or 30 people you work with frequently. Then, with a simple monthly chart, write down how many times you have had positive interactions or meetings, in which you gave something - usually your time, listening and experience - to each of these people. Try to keep the table updated, at it will indicate precisely when you are building bridges of trust, and if you have forgotten someone. Do the same for people who do not work in your company but who you should keep in touch with. At least two or three times a year, contact them without asking for anything, for example by sending an interesting article that might be useful to them, or a simple invitation for a coffee. If they call you, make yourself available if at all possible. Doors will open, in an almost magical fashion. We do not work alone: we always need others, and we must continually demonstrate that we cooperate honestly with colleagues, even those who are not always pleasant to work with. I confess that one of the criteria I use to assess whether my day was positive or not is based on this: have I helped to keep a relationship of trust alive, have I been generous with my time to help others? Have I invested in my trust capital, eroded it, kept it at the same level? At times I believe I failed in building trust, and when this happens a candid conversation helps. "Did I add at least one brick to the bridge?" Let us ask ourselves every day: "Did I put at least one brick into the construction of the bridge?". These bridges are built gradually, but they last forever, and they open up new roads and possibilities. Let us remember that the majority of jobs are given based on the knowledge and confidence that we have built, not on how elegantly we have written our Curriculum Vitae. Our reputation will always precede us: our reputation is the only thing we have. We have to be cautious of people who are only ever available to take energy from us; the psychologist and author Adam Grant calls them "the takers". I suggest applying the "rule of three": if we had three meetings where we just gave and never received anything, test the person involved with a minor request for input; if they ignore it, reconsider, if possible, your own investment in the relationship. If the person never contacts you, no big deal as you have lost a "taker", if the person does get in touch, it could be the opening of a meaningful conversation. In their book, The Trusted Advisor , David Maister and Charles Green give a very effective formula for understanding how to create trust. Careful: the sum of credibility, reliability and intimacy (being there when needed) has to be divided by self-orientation (a conflict of interest where your own agenda is at play, undermining what you are offering.) So, when we are building trust, we need to be mindful of real - or even only perceived - conflict of interest. 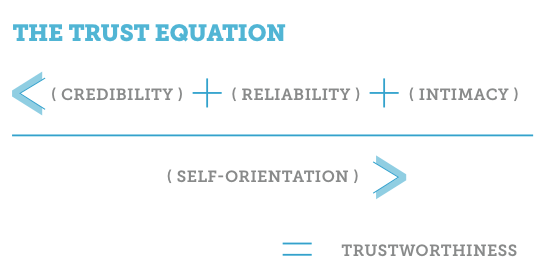 We need to build trust, but also to give it in return, building reciprocal confidence. An extraordinary act of trust is to ask for help: not only to show that we are not infallible, but that we have the courage to be vulnerable. This will help your colleagues feel confident enough to ask for help in return, building a virtuous circle of trust. The times of pseudo-heroic and usually narcissistic leadership, based on one person knows all the answers, are long gone. Trust, the basis of mutual cooperation, is the only way forward. We should resist the building of walls, whether in Mexico or in our professional lives.